For use with 8-1/2" x 11", 16lb to 28lb. bond paper, 60gsm to 105gsm. Creates four folds: Letter, Half, Z-fold and Double-Parallel. The Martin Yale P7200 Rapidfold desktop paper folding machine is really alone in its class. Its small footprint make it easy to store and means that it doesn't take up a lot of space in your office or mailroom. The P7200 is capable of doing two common folds and is able to continuously feed up to 50 sheets of 20lb bond stock. The Martin Yale Premier P7200 is able to accommodate most copy papers and letterheads and is perfect for offices who need to fold moderate numbers of letters or flyers. The P7200 is easy to set up and simple to operate. Check out the P7200 paper folder today. Automatically feeds and folds a stack of documents. Stacking tray for convenient folded document collection. We had large mailing in the front school office and folding took forever. This machine has helped tremendously! It comes basically ready to go with a few simple attachments. I did have to change the settings a little bit to make it fold straight because it did crumble 2-3 papers so far, but that's out of hundreds so far. I also added a folder to the catcher section because they would fall out onto the floor, which has helped (Just folded a file folder to fit inside catcher and taped it to the machine. I did not need the static spray yet, but did order it for the future like suggested. GREAT time saver!! Love it… Review by Stephen K.
Works perfectly. It takes a few minutes to set up but otherwise, it's so quick to use. It's saving us hours a week of work. The Martin Yale P7200 RapidFold Desktop Auto Folding Machine is a small step up from very basic machines but still offers a convenient compact design. Additional features increase efficiency as compared to lower models. This device is perfectly suitable for small to medium offices, moderate mail rooms, churches and schools. Here is a closer look at the strengths and weaknesses of the P7200. Boasting of a petite design, this machine won't take up too much space on your desktop or table. The included stacking tray hangs over the side of a desk or table to catch folded items as they emerge. Besides small, this device is also lightweight, weighing only 17 pounds. It can be easily moved from one desk to another for shared use. Set-up is minimal on this machine, it works right out of the box. Simply adjust the knobs to the setting you want, following the visual guide, and you're ready to fold. The feed tray holds a half inch stack of papers waiting go through. Documents are automatically fed and folded continuously up to 50 sheets of 20lb bond paper at one time. The machine is equipped to handle paper ranging from 16lb-28lb. Items as small as 4-3/4" x 5" can be folded with the largest size being standard 8-1/2" x 11" or A4 paper. A manual feed offers insertion of up to three sheets of loose or stapled paper at once. The plates on this folder are able to provide letter folds and half folds. On the trifold letter setting, sheets go through as fast as 4000 sheets per hour. This is the first machine designed to handle digital laser printed paper. Although paper jams are rare on this machine, the components are easily accessible should you need to clear any jams. The manufacturer provides a limited one year warranty against defects. Although this folder is a step up from some smaller machines, it still can't handle heavy materials. That means no cardstocks or glossy paper. Many offices don't use these paper mediums and won't mind this downside. But it is something to consider if your office does need to fold heavier weight or specialty papers. Larger models by Martin Yale do offer this capability. Another thing to consider is the number of fold styles you need. This one only produces the two most basic folds. The next model up, the P7400, offers an additional two folds- the "Z" fold and double parallel folds- but also costs a little bit more. One last thing is the limitation to letter size. Again, this is all many offices will need. However, businesses wishing to fold legal sized or larger items may also prefer the larger P7400. For moderate use in a smaller or medium office, the Martin Yale P7200 is a great folder. Able to quickly fold documents into either letter or half folds, this device is both efficient and easy to use. With increased efficiency, your company will save time and money; this machine will eventually pay for itself. Though it may have a few downsides, it will meet the basic needs of many smaller offices. We think the P7200 is a good choice for your next office paper folder. Sheet Size Range Min: 4" x 4"
Max: 12" x 18" Min: 3 1/2" x 5"
Max: 8 3/4" x 14" Min: 8 1/2" x 11"
Max: 8 1/2" x 14" Min: 8 1/2" x 11"
Max: 8 1/2" x 11" Min: 8 1/2" x 11"
Max: 8 1/2" x 11""
Size (W x D x H) 42" x 17.5" x 17" 24" x 15" x 16" 20" x 13" x 10 1/2" 20" x 13" x 10 1/2" 14 1/4" x 6 3/4" x 7" 13" x 5 3/4" x 5 7/8"
Shpg. Wt. 59 lbs. 38 lbs. 17 lbs. 20 lbs. 12 lbs. 11 lbs. I'm needed to Z-fold standard mailing envelopes. Will the Martin Yale P7200 RapidFold Desktop Auto Folding Machine do this? Thank you for your question. 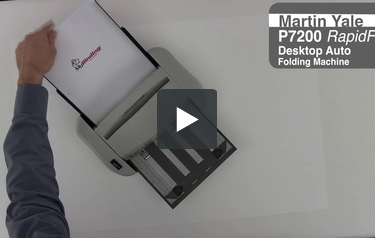 The Martin Yale P7200 RapidFold Desktop Auto Folding Machine can do many folds including a Z-fold. I have newsletters that are one piece of paper folded lengthwise creating an 8 1/2 x 11 size. In otherwords, it's two pages connected by a left side fold. Can those go through the machine automatically or would they have to be manually fed? Thank you for your question. With the Martin Yale P7200 RapidFold Desktop Auto Folding Machine for anything other than a single sheet/ply of paper it would need to be manually fed. It would not be able to be set up to run automatically. Can I change the size of the 2 fold on a Z fold. Letter I have told have addresses in different places. Thank you for your question. With the Martin Yale P7200 RapidFold Desktop Auto Folding Machine you manually adjust the position of the fold plates to change the type of folds you are doing. You would be able to adjust the position of the folds within a Z-fold. Because it is a manual process it would just take some trial and error to get the folds adjusted to your needs. Hello My Binding, the manual Pdf for this machine says this can fold letter, Z, half and Double Pararell but only for 8.5x11 paper but reading your description of the product you only say that this machine can only do letter and half fold. What is real? Thank you for your question. The Martin Yale P7200 RapidFold Desktop Auto Folding Machine is able to be set up to do Letter, Half, Z-fold and Double-Parallel folds. Does the machine fold half of a regular paper length wise? Thank you for your question. The Martin Yale P7200 RapidFold Desktop Auto Folding Machine would not be able to fold a letter sized sheet length wise. The folder is only capable of folding along the width.